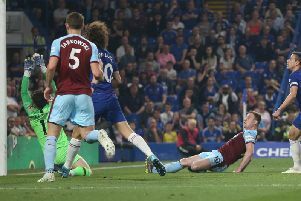 Sean Dyche says that the Clarets will not just settle for what they already have this season but added that there has to be a reality to the club’s end goal. Burnley have undoubtedly raised the bar following their achievements in the Premier League this term, pushing to within five points of sixth placed Arsenal with 15 games remaining, and Dyche is keen to manage that shift in expectations. The 46-year-old former Chesterfield and Watford defender understands the magnitude of the challenge ahead, he’s more than aware of the strength of the division, but his ambition will naturally keep him wanting the best. Asked if expectations had exploded, he said: “Expectations from afar have. I think the fans are enjoying it but I don’t think they’re getting carried away, they know it’s a building process, they’ve seen the club build over five seasons. “They know there’s still a reality to the challenge, we’re still fighting against the big guns, the gap in finance is still massive. “I don’t think they’re worried about it, it’s more can we keep going and keep maintaining it? Dyche added: “I think there’s an appropriate amount of expectation, not always, I think the game has changed, often there’s mad expectation. “But mostly it’s in line with us. Were people expecting us to be seventh? No, so therefore they’re delivering a good season. I think that’s fair. I think our fans will look at it like that. Burnley’s loss against Crystal Palace at Selhurst Park condemned the club to a sixth game without a win in the top flight. However, Dyche put that sequence in to context with the club sat in seventh spot and eight points clear of the Hornets in mid-table. “You have your own internal pressures way more than anybody could write about,” he said. “The players should have that and I think ours do, there’s an authenticity to it and an honesty to it. “There’s a lot more demand on me to continue pushing them and then they push each other. That doesn’t go away. He added: “Before this we’d won three out of four. There’s always an urgency to perform and get points regardless of your runs. “If you add this run into the rest of the season you’d actually go ‘it’s still a fantastic season’. That has to be put in the melting pot. “Early season we were the right side of the margins, the margins are still tight but now we’re not the right side of them.